In the UK, prostate cancer is the most common cancer in men, affecting one in eight men during their lifetime. 47,200 new cases were diagnosed in 2015 and over the last 10 years diagnosis has increased by 6%. Prostate cancer survival is improving and has tripled in the last 40 years in the UK; however it remains the second most common cause of male cancer death, with around 11,300 deaths in 2014. Prostate cancer accounts for the highest number of patients waiting for more than 62 days from referral to treatment in the UK. We have worked hard to find a more precise diagnosis and treatment of prostate cancer. The charity has supported research studies since 2005 and was the first to support research into the use of MRI for diagnosis and different focal therapies for precise treatment. Since 2006 we have organised regular meetings, bringing together international experts to discuss developments and push the boundaries towards more precise treatment. In 2012 we hosted an international meeting at NYU (right), with specialists from around the world, to discuss the criteria for MR target biopsy and the PRECISION trial. 25 centres from 11 countries recruited patients and the results were published in the NEJM in 2018. Prostate cancer is a less aggressive cancer but its diagnosis and treatment are complex, often leaving men with multiple options and decisions. It is estimated that 30% of delays between referral and treatment are during the diagnosis phase and therefore implementing best practice and optimising clinical time are a priority for men and the NHS. Centres have initiated a variety of different improvements to the pathway – for example ‘one stop clinics’, improved MRI reporting, streamlined pathology reporting. But the changes are challenging, require advanced skills, reorganised clinics and multi-disciplinary collaboration; meaning that practice and change has been variable across the country. All clinicians want the best diagnosis, treatment and outcomes for their patients but in a busy hospital it is challenging to implement change and for everyone in the cancer team to understand the rationale and evidence for change. New prostate cancer pathways are being published by different organisations and units are keen to standardise processes and develop protocols to coincide with national guidelines. TIPTOP will be a two year programme, designed by an eminent steering group (right). There has been regular discussion between different specialities to develop the workshop programme and collect materials and references to support wider learning. We have consulted with Prostate Cancer UK and look forward to collaborating with them to encourage a joined up offer for all specialties. 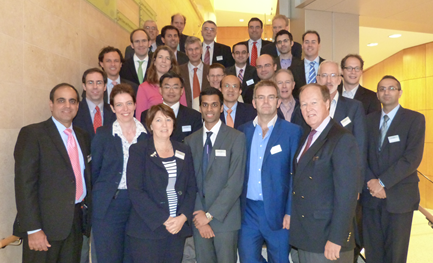 7 core members of every multi-disciplinary urology team that discusses prostate cancer across GB and Ireland. This should include a urologist, oncologist, radiologist, pathologist, CNS, manager and radiographer. We will work with the Cancer Alliances to explore local priorities and solutions. The TIPTOP workshops will be free for 7 specialists from each hospital, they will be asked to complete two tasks before the workshop to encourage engagement, provide a snapshot of current practice and provide material to feedback during the workshop. The aim of TIPTOP is to help multidisciplinary urology specialists develop as a unit, to understand the changes to the prostate cancer pathway and work together to develop their local and regional strategy so that patients have the best diagnosis and treatment at the best time for them. Additionally, the programme aims to save money and time for the NHS as evidenced in the following papers: Prostate cancer: diagnosis and management and Costing statement: prostate cancer: diagnosis and treatment. TIPTOP has been welcomed by urologists and specialists in this field.